Or for those of you already there or due there on friday Tune in to Radio WOMAD on 87.7FM, the Charlton Park audience can listen to the sounds of Radio WOMAD - the festival's very own station, which will be broadcasting within 20 miles of the festival site from midday on Wednesday 23 July and continuing around the clock until Monday 28 July. There'll be plenty of music, exclusive interviews and live sessions with festival performers, competitions, reviews and thoughts from the audience, plus important updates about the festival site and programme; so don't forget to bring along a FM radio and tune in to 87.7FM! 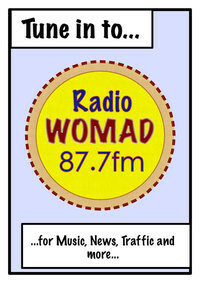 Keep listening and send Radio Womad your shout outs and requests!.